Directed by Michael Lindsay-Hogg, The Rolling Stones Rock and Roll Circus is a concert film showcasing the Rolling Stones playing a show on December 11, 1968 as the show would also include performances from Jethro Tull, the Who, Taj Mahal, Marianne Faithfull, and John Lennon in a super-group with future-wife Yoko Ono, Eric Clapton, and Mitch Mitchell of the Jimi Hendrix Experience. Released in 1996, the film chronicles a period in the career of the Rolling Stones which would feature one of their final performances with founding member in guitarist Brian Jones. The result is a fascinating and entertaining film from Michael Lindsay-Hogg. The film is simply a concert film during a tumultuous year in world history as people would come together to attend a circus hosted by the Rolling Stones. The concert wouldn’t just feature a few circus performances but also performances from other musical acts such as Jethro Tull, the Who, Taj Mahal, Marianne Faithfull, and a one-time only supergroup featuring John Lennon, Eric Clapton, Mitch Mitchell, Yoko Ono, and the Stones’ Keith Richards on bass called the Dirty Mac. It is a film that showcases a period in the career of the Rolling Stones at a time when they were becoming one of the premier acts in rock n’ roll yet it is also a crucial period as it would show the dwindling role of band co-founder in guitarist Brian Jones who would die several months later after the concert as the film shows him in one of his final performances with the group. Michael Lindsay-Hogg’s direction is quite simple as it would feature some close-ups of the performances as well as reaction from the audience that include some of the performers as there are a couple of circus performances that come in between the musical performances. Jethro Tull would have the performance for A Song for Jeffrey that would feature future Black Sabbath guitarist/co-founder Tony Iommi miming Mick Abrahams’ guitar as most of the performances in the film is live such as the Who doing A Quick One While He’s Away, Taj Mahal in the song Ain’t That a Lot of Love, and Marianne Faithfull performing Something’s Better. Yet, it is the Who’s performance that is a real standout as it showcases a band that was about to become very big just a year before they would make their magnum opus that is the rock opera Tommy. The performance of the Dirty Mac led by John Lennon marks an interesting footnote of history for Lennon as it is his first public performance as a solo artist just around the time he was still in the Beatles who were to disband more than a year later. The performance of the song Yer Blues from The White Album is definitely faithful to the original Beatles recording thanks in part to Eric Clapton’s guitar work as they would perform an improvised blues-based track called Whole Lotta Yoko with violinist Ivry Gitlis and Ono providing the vocals. The Stones’ performance would conclude the film for live renditions of Jumpin’ Jack Flash, Parachute Woman, No Expectations, Can’t Always Get What You Want, and Sympathy for the Devil while the film ends with a miming performance of sorts of Salt of the Earth. The film’s cinematography by Anthony B. Richmond is quite grainy as there’s marks in the film footage which definitely adds something rich to the film’s look as Lindsay-Hogg captures everything that is happening including some of the introductions. Editors Ruth Foster and Robin Klein would assemble many of the footage as the latter would be in charge for the remastering of the film with Lindsay-Hogg’s help as it help adds a richness to the quality of the film. Sound editor Magdaline Volaitis would also be involved in the film’s remastering as well as with the music to make sure it sounds full since much of the film had been lost and shelved for many years until the late 80s. 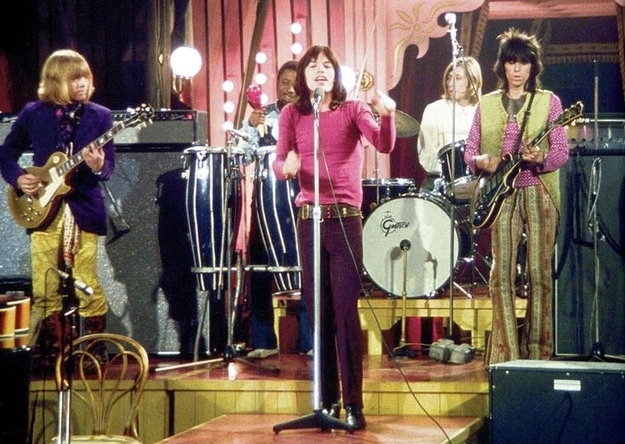 The Rolling Stones Rock and Roll Circus is a splendid film from Michael Lindsay-Hogg. It’s a film that showcases a period in time where the Stones was entering its golden period as well as showcasing acts from that period either entering into a new phase of their career or just getting started. In the end, The Rolling Stones Rock and Roll Circus is a delightful film from Michael Lindsay-Hogg.